Tannoy is among the elder statesmen of the British speaker industry, and the ethos of its Prestige range of speakers has gone unchanged for half a century, taking the 'if it ain't broke, don't fix it' dictum to a new extreme. More recently, the Arena series of sub/satellite packages has been Tannoy's offering in this extremely competitive category and the Highline 300 LCR is newly released and tested here. Unlike the original Arena that is a relatively stocky set of satellites with a dedicated centre speaker, the 300 LCR system comprises five identical satellites. These each take the form of a 60cm-long, metal 'finger' with a fixed grill covering the drivers. Each LCR contains four 3-inch drivers and a single 0.75-inch tweeter. Although relatively large for a 'satellite' speaker, the LCR is not full range, with Tannoy only quoting a frequency response down to 95Hz. 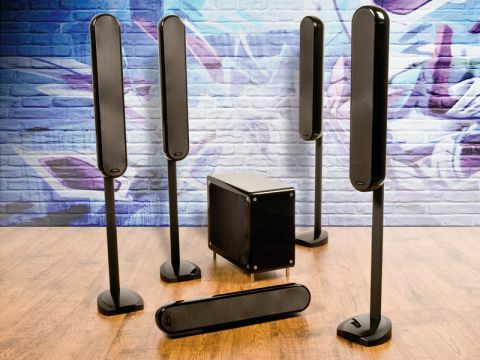 The advantage of the long slim design is that a 300 LCR is equally happy placed vertically as in a left or right hand position, or horizontally as a centre speaker. This makes for a visually elegant solution and a sonically effective one. With all speakers sharing exactly the same driver complement and cabinet volume, their behaviour should be identical. This means that the handover from left to right and front to back should be seamless. Placing the 300 LCR's is a simple enough business as well. Tannoy says the design has been voiced with a view to wall mounting or at least for use close to a wall (hence their flatscreen TV-matching aesthetic). To this end, they are supplied with a wall bracket, and Tannoy has paid attention to recess the rear terminals for a flush fit (up until the point you want to use banana plugs anyway). A tabletop stand is supplied, as well as a cradle, for using a 300 LCR on its side. A floorstand is also available and the review was carried out with all save the centre mounted on these. The matching Highline TS300 Subwoofer consists of a sealed enclosure with a 300W BASH amplifier powering a 10-inch driver. As subwoofers go, this is an attractive unit with the driver concealed behind a grill and a relatively slim profile. A very well received feature is Tannoy's decision to turn the controls into a part of the design. The front panel features all of the controls you normally contort yourself around the back of the subwoofer to operate, with handsome chrome knobs for each. Unless you are concerned that children are going to wind the volume up to maximum when you're not looking, this makes a great deal of sense to me. Mounted with the driver to one side to reduce the footprint, the only minor gripe is that the feet and stands need to be extended a considerable distance to give the required clearance to the underside of the sub where the mains and LFE input are placed. Fit and finish is very good. The metal-bodied satellites feel solid and are braced with what Tannoy's Differential Material Technology, which is designed to reduce resonance. The result is a hefty weight of 5kg per speaker. The gloss finish is excellent and gives the satellites a look and feel commensurate with the asking price. Purists may bemoan the lack of detachable grilles but, in reality, the the Highline's typical end-user won't want naked drivers on show. The brackets and stands are logical in terms of fitting and mounting, although there is a daunting moment when you open the box to be confronted with something that looks like a Meccano kit. The good news is that most of the screws and fastenings stay in the box. Fitting the speakers to the stands proved sufficiently logical, although it was tricky to get a perfectly solid fit between speaker and stand. The resulting tower feels stable enough and the newer version of the stand (we've used an older model) will have a larger base, further improving stability. Setup of is simple. The voicing effort pays off as they seem to be unconcerned with being placed right up against walls or right into a corner, which can often seriously affect other satellites. The sub performed best towards the front of my room and didn't set off any of the resonances that can be provoked. An averagely competent auto setup program should be able to get the Arenas working well. The performance of the Highline system is very appealing. The King's Speech is given an insightful presentation, with the satellites retrieving the detail from the soundtrack extremely well, while managing to bring incidental effects out without losing the all-important dialogue. Voices are well presented and manage to sound believable. Congested passages remain easy to follow. As the design would suggest, the handover from speaker to speaker is seamless, and coped well with the tweeters on the left and right speakers being at a significantly different level to the tweeter in the centre unit. The soundstage across the front is cohesive and superior. This is equally effective front to back. The effect isn't perfect, however; the dispersion of the satellites seems quite narrow. The Tannoys will not produce as large a soundstage as some more conventional designs of a similar price and the result is that there is a definite sweetspot for listening, more so than some other sub/sat designs. Placing the front left and right speakers wider apart with a little toe-in improved matters slightly, but didn't eliminate them entirely. The TS300 subwoofer is also a very civilised performer. Handover between it and the satellites is good and worked best at nearer 80Hz than the 95Hz suggested by the specs. Given the more muscular mayhem of Unstoppable, it manages to combine suitable heft with explosions while staying free of bloat and overhang. In an absolute sense, there are more ballistic performers, but few that also manage to look as elegant as this combination does. Both the subwoofer and the satellites retain their composure when pushed hard, and they prove sensitive enough to go pretty loud without any signs of undue strain from the amplifier. Given the company's long pedigree in two-channel hi-fi , it isn't much of surprise to discover the Arena's are very capable with music. The excellent tonality and insight into the mix makes for a convincing performance, although once again they don't produce the most extensive soundstage. The Arenas are a well considered speaker package that combines a very elegant design aesthetic with a level of performance that keeps more conventional designs honest. If I'm being really picky, there is always a sense that the Tannoy's are a little too civilised where other designs would let rip, and the relatively narrow sweet spot could be an annoyance, but these should not detract from the wider whole. If you want a package that can entertain without dominating the room, the Arenas deserve an audition.